Heading into Week 8, as we do each week in this space, we’ll be looking at some of my top DFS tournament plays of the week. We’ll be naming one player at each position and on each site for the main slate. As amazing as Patrick Mahomes has been (second-most fantasy points scored by a quarterback through seven weeks all-time), Tampa Bay’s QB1 has been better. Winston and Ryan Fitzpatrick combine to average 28.1 fantasy points per game to Mahomes’ 28.0. Together they’ve totaled 2,261 passing yards, which is 38 fewer than the Chiefs despite playing in one fewer game, and more than any other team through their first six games, save for the 2000 “Greatest Show on Turf” Rams who had only 14 more. The Tampa Bay passing attack is rolling, their defense is still historically bad, and their running game is still equally inept, and now they have an A+ matchup to top it all off. Cincinnati ranks ninth-worst in opposing passer rating, sixth-worst in fantasy points allowed per dropback, and fourth-worst in points allowed per drive. 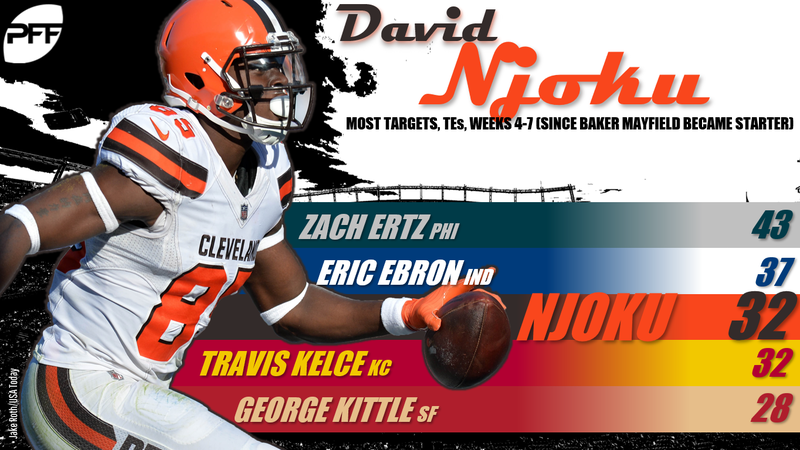 This comes on the heels of a much tougher matchup against the Browns, who rank top three in all categories – and remember, Winston still finished third at the position in DraftKings fantasy points last week. He’s a slightly better play there than FanDuel, as he’s a near-lock to hit the 300-yard-bonus, averaging 328.0 passing yards per game over the past two seasons (excluding incomplete games), which easily ranks best over this span. Gurley is expensive even as far as expensive running backs are concerned, but I don’t think he’d be expensive if he was LaDainian Tomlinson in his prime, and that’s basically the best comparison for who he’s been this year. Gurley is on pace for 467.7 fantasy points, or the second-most by any player at any position all-time. He’s also on pace for 32 touchdowns, or the most by any player all-time. He averages 32.8 fantasy points per game over his last 10 games, and with at least 20.0 fantasy points in each of these games. And his volume has been just as good as production. Gurley is averaging 22.5 expected fantasy points per game, which is 3.1 more than last year and what would be the most by any player at any position of (at least) the past decade. He’s also leading in expected fantasy point market share (31.7%) and expected touchdown market share (48.8%). That becomes important when we realize the Rams have the highest implied point total of the slate (33.3). Despite the high price tag, Gurley is still a value – he’s just hard to fit. By my data, Adams has easily had the league’s toughest cornerback schedule to start the year. He’s faced shadow coverage against Darius Slay, Xavier Rhodes, and Tre’Davious White, as well as matchups against San Francisco and Chicago, who rank 10th- and fifth-best (respectively) in schedule-adjusted fantasy points per game allowed to opposing WR1s. His softest matchup of the year was against Washington, who are more neutral than soft. In spite of this, he still ranks fifth in expected- and fourth in actual fantasy points per game, or first and second over the past four weeks. This week, in a pass-heavy game-script (underdogs by 9.5) he’ll run about 80% of his routes against Troy Hill and Marcus Peters. Over the last two weeks, Hill has surrendered 11 receptions, 208 yards, and a score on 16 targets. Peters had a brutal stretch from Weeks 3 to 5, giving up 255 yards and five touchdowns in coverage, and has been better or not really tested since (two receptions on two targets). Peters doesn’t shadow, so this is probably Adams’ best matchup of the year, making him my top wide receiver play of the week. Kelce is $6,800 on DraftKings, or about $300 cheaper than his average over the second-half of last year. Considering he’s averaging more expected- and actual fantasy points per game this year, that might make him a value. The matchup looks good as well, as Denver is still a tight end funnel defense – giving up 25% of their passing yardage allowed to tight ends, which ranks seventh-most. His value becomes all the more glaring this week, however, given the state of the position as a whole and on a week where Zach Ertz and Rob Gronkowski are off the main slate. Rodgers is fresh off of a bye following back-to-back 400-yard performances. In fact, he became the first quarterback to ever post back-to-back 400-yard games without throwing an interception. He’ll be forced to go pass-heavy this week as 9.5-point underdogs and in a good-to-great matchup. C.J. Beathard disappointed last week against the Rams, but before that the Rams were giving up 24.0 fantasy points per game in the three games since losing Aqib Talib. There might be better values at the position, and certainly a few quarterbacks with a higher floor, but none with a ceiling greater than Rodgers’. After OC Mike McCoy’s firing, new OC Byron Leftwich has said he’s going to use Johnson in a manner similar to how Bruce Arians used him in 2016 (he comes from that regime) and that getting Johnson more, and more optimized, looks is one of the team’s top priorities. Johnson’s usage has been decent this year but nothing close to his 2016 season, which ranks second-best by any player this past decade in terms of expected fantasy points. This year, Johnson ranks 10th in expected fantasy points per game and fourth in expected fantasy point market share. That latter point is especially important given the uptick in pace we should expect from Leftwich. Arizona ranked second in plays per game in 2016 (67.9) but ranks 32nd this year (52.6). Essentially, Johnson would be appropriately priced if McCoy were still the OC, $2,500 too cheap if this were 2016, and about $1,000 to cheap this week. The matchup is strong as well, in a close game (1.5-point spread) against a San Francisco defense ranking seventh-worst in schedule-adjusted fantasy points per game surrendered to opposing running backs. I feel like I say this every week, but Landry is again one of the most underpriced players on FanDuel relative to usage. He’s only the 15th-highest-priced player at the position, despite ranking third at the position in expected fantasy points per game. He also ranks sixth in targets per game, 12th in air yards per game, and sixth in expected touchdowns per game. Efficiency hasn’t been as good, but it was better last week, and now Landry has a comparably great matchup and his price has barely budged (up $200). The Steelers are surrendering the third-most fantasy points per game to slot wide receivers, which is where Landry runs 72% of his routes. As I said here, he’s a top option, meaning top-five in my rankings. Clearly, as the 11th-highest-priced tight end on FanDuel, he’s a top value.